Put potatoes in a large pot and add enough salted water to cover. Bring to a boil and boil potatoes until fork tender – about 15 minutes. Drain potatoes and cool. While potatoes cool, prepare the dressing. In a medium bowl, blend half of the green onions with the sour cream, mayonnaise, white wine vinegar, Dijon mustard, sugar, salt and pepper. Cover and chill. Slice the potatoes into 1/2-inch slices or chunky quarters and place into large bowl. 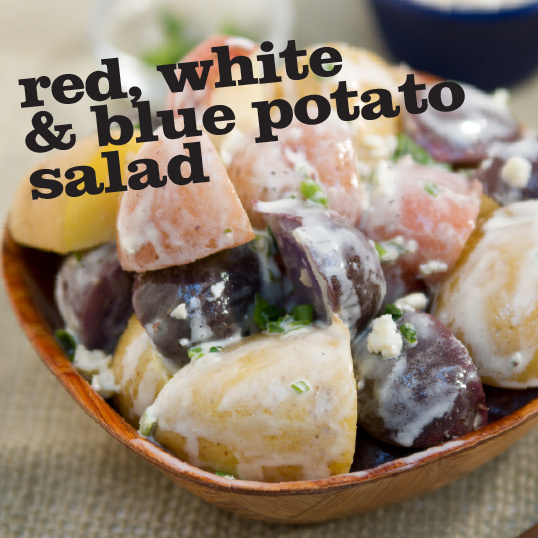 Add chilled dressing, blue cheese and remaining green onions; toss gently to coat potato pieces. (Add additional blue cheese, if desired.) Cover and chill for at least two hours, or up to one day. Flavors will continue to blend as the salad chills.